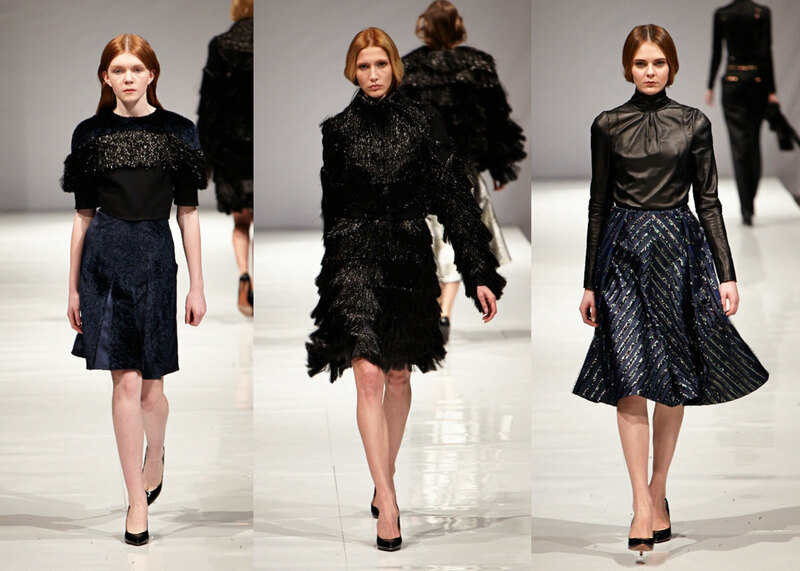 Anna October, shown at Ukraine’s Kiev Fashion Days, paints an upcoming Fall season that while cold, will be ever present with elegance. Anna’s luxe getups gracing the Kiev runway are visibly supple, speaking to the high quality of the silk fabrication in use. The aesthetic is pulled-together, modern, and rich, with a dark and sophisticated color palette of black, navy, rust, gold, and pewter. Texture comes into play to keep even the most basic of ensembles, all black for instance, from becoming boring. Iridescent-threaded trims add opulence, while shimmering chevron stripes play up modest necklines and voluminous skirts. While we’re talking about sheen, the metallic pieces in this collection are absolute showstoppers. 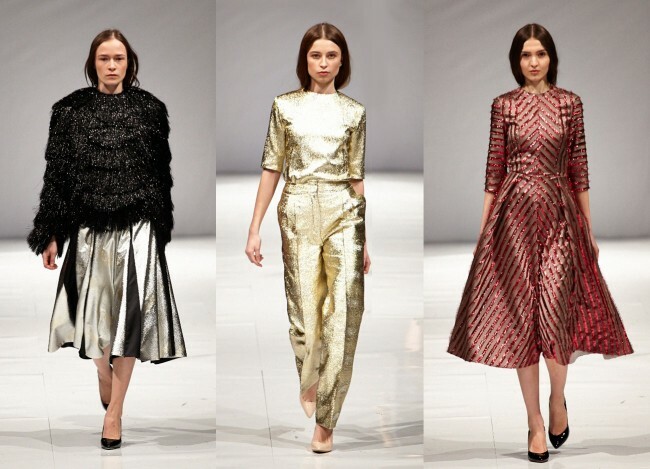 The fluid movement exhibited by both the gold pantsuit and the pewter dress is impressive. Such heavily foiled fabrications if improperly spun can be rigid and difficult to mold, but that was far from the case at Anna October. 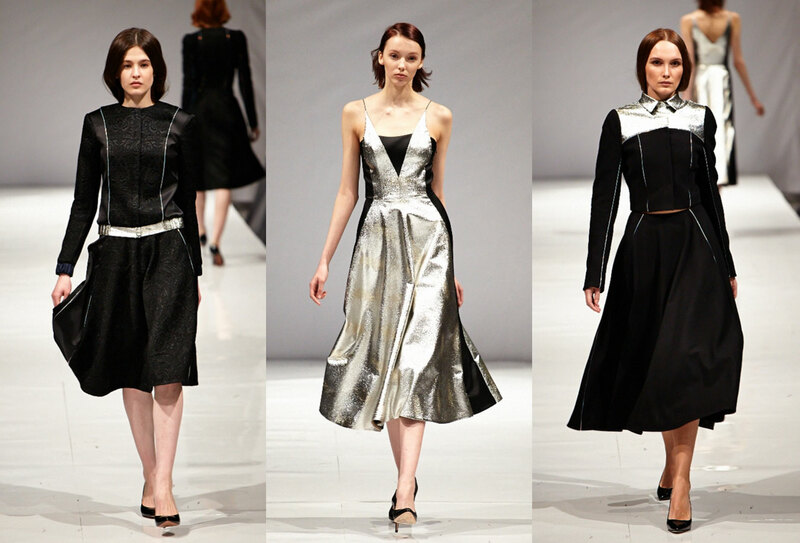 Only malleable metals for her, speaking volumes to the level of craftsmanship achieved by Anna as a designer. Tinseled head-to-toe looks give a nod to the Flapper Age when women defied boundaries and explored their independence. The show grows in this way as well, starting out conservative, taking a turn for the uber-modern, and then ending on a feminine note. 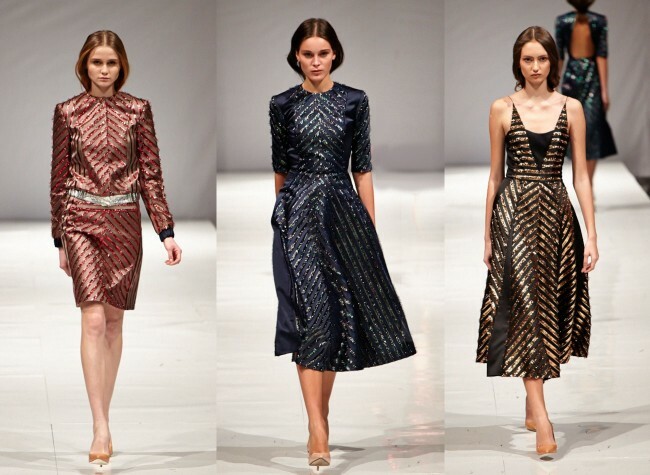 This collection is for the woman who appreciates dressing to the nines, a skill that is second nature to Eastern European women. Holiday parties are the perfect calling for Anna October’s dapper designs. Go on, don one of Anna’s fabulous furnishings this Fall, and while you’re at it, don’t forget to break all the rules.